Like this? Share It With a Friend! ..
How to Nap Properly in Ramadan! SUMMARY: One way to minimize sleep debt during Ramadan is by following the prophetic sunnah of napping. However, not all naps are the same. This article discusses that naps should ideally be taken earlier during the day, scheduled consistently, SHORT in duration, taken in darkness and should be followed by movement. However, there are some RULES to nap effectively to ensure you are making yourself feel more rested with your nap. When abused, naps may actually prevent you from sleeping at night, so it is important not to consider your naps as a replacement for your sleep. You can nap when your nighttime sleep is efficient, but you still feel sleepy (perhaps due to sleep debt). Efficient sleep means that you are sleeping most of the time you are in bed. 100% indicates you may be sleep deprived so you fall asleep immediately as soon as you fall into bed. If your sleep is not efficient, use the strategies for Sleep Hygiene in the next section to improve your sleep quality. Naps should ideally be taken earlier in the day. An EARLY nap adds to the previous night sleep, while a later nap may take away from your next night’s sleep (5). Naps should be consistently SCHEDULED at the same time every day so your circadian rhythms can adjust to expect a nap at the same time roughly every day. You do not always have to nap. But when you do, try to always nap at around the SAME TIME. Naps should be short. All you need is 20-30 minutes of napping to provide a boost in wakefulness without creating more drowsiness. Napping is not meant to allow you to transition into deeper stages of sleep. If you sleep for too long, you may enter into a deep sleep, unscheduled. Awaking abruptly from this deep sleep makes you feel awful. A Nap should ideally ONLY be in the light stages of sleep. Naps should be taken in comfort and complete darkness.Your body sleeps best in total darkness and reclined. Avoid napping in a bright room while sitting in a chair. If you cannot control the light in your nap room, buy a cheap eye mask to help you block out the light. This will allow you to make the most of your short power nap. Naps should be followed up with movement and sunlight to boost wakefulness. Movement and sunlight are cues for wakefulness and will help your body feel refreshed and recharged after your nap, so you can get on with your day with greater energy! Once you’re napping at consistent times and scheduling your naps effectively, it’s time to boost the QUALITY of your sleep every day. In this final article on sleep, learn how to IMPROVE the quality of your sleep by identifying common SLEEP THIEVES in your bedroom! Healthy FOOD, EXERCISE and SLEEP must come together for your HEALTHIEST Ramadan ever! Luckily, we’ve got you covered! The Ramadan Reset eBook is your complete solution to healthy eating, exercise, sleep, coffee and so much more in Ramadan! With 90 dietitian-created recipes, full fasting fitness schedules for ALL levels, your Ramadan will never be the same! Click HERE to learn more! 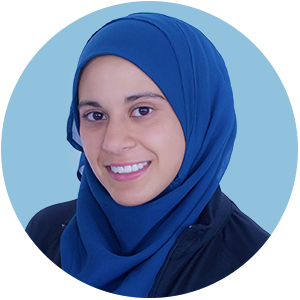 Amina is pursuing her PhD Degree in Health Psychology at Walden University and Founder of Amanah Fitness. She is passionate about research-based health education to empower Muslims to live healthier, active lifestyles! She enjoys working out, travelling and outdoor active adventures. BaHammam, A. (2003). Sleep pattern, daytime sleepiness, and eating habits during the month of Ramadan. Sleep and Hypnosis, 5, 165-174. Winter, W. C. (2017). The Sleep Solution: Why Your Sleep is Broken and how to Fix it. Penguin. Asarnow, L. D., McGlinchey, E., & Harvey, A. G. (2015). Evidence for a possible link between bedtime and change in body mass index. Sleep, 38(10), 1523-1527. Broussard, J. L., Kilkus, J. M., Delebecque, F., Abraham, V., Day, A., Whitmore, H. R., & Tasali, E. (2016). Elevated ghrelin predicts food intake during experimental sleep restriction. Obesity, 24(1), 132-138. Broussard, J. L., Wroblewski, K., Kilkus, J. M., & Tasali, E. (2016). Two nights of recovery sleep reverses the effects of short-term sleep restriction on diabetes risk. Diabetes Care, 39(3), e40-e41. Greer, S. M., Goldstein, A. N., & Walker, M. P. (2013). The impact of sleep deprivation on food desire in the human brain. Nature communications, 4, 3259. How much coffee can you drink in Ramadan? Thank you! We'll send you the healthy Ramadan meal-planning guide shortly inshAllah! Get your free Healthy Ramadan Checklist! EVERYTHING you need to know about Health & Fitness in Ramadan!